The chairman of the Iowa Republican Party recently spent four days in Washington, D.C. to ask national party leaders to commit financial support for the Iowa GOP’s 2018 campaign efforts. Jeff Kaufmann met with the chairwoman of the Republican National Committee and her staff. “Wanted to have some face-to-face conversations,” Kaufmann said. There’s no statewide federal race in Iowa in 2018 and Kaufmann is in stiff competition with party leaders in states where key U.S. Senate races will take place. 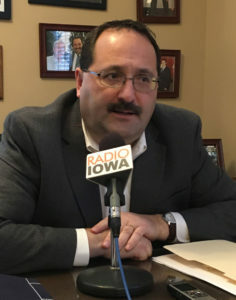 Kaufmann said he needs national party spending in Iowa to maintain the campaign infrastructure that led to Republican victories in Iowa in 2014 and 2016. Red is now associated with Republicans and blue with Democrats. Many Electoral College maps distinguishing states won by Republican candidates with the color red and with the color blue if the state was carried by a Democratic candidate. Kaufmann also was among a group of party leaders from a handful of states who were invited to meet with President Trump at the White House on May 18. On Friday, the Iowa GOP will host a party for new Governor Kim Reynolds. On Saturday, Senator Joni Ernst will host Vice President Mike Pence as the headliner at her third annual “Roast and Ride” fundraiser.